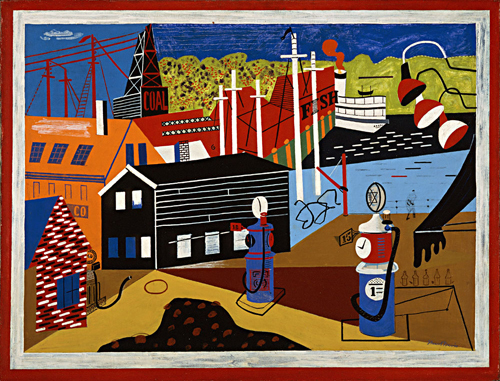 Stuart Davis began as a student of the Urban Realist style, but upon seeing the many European modernist works on display at the New York Armory Show of 1913, the artist found his passion for abstraction. The influence of the broken-up and flattened surfaces of Cubism and the syncopated rhythms of American jazz contributed to Davis' personal style. Gloucester, one of Massachusetts's oldest seaports, was a summer home for painter Stuart Davis from the time he was a young man of twenty-two. This view of the harbor clearly captivated him by the early 1930s, and preliminary studies of this painting reveal how carefully he considered the scene and translated it into paint, all the while deliberately conveying a sense of simplicity and speed in its execution. After a Parisian stay in the late 1920s, Davis returned to the United States with a new way of seeing things. The goal for him was to paint an expressive, abstracted version of the world around him, rather than a photographic simulacrum. As modernism challenged the nature of reality and how it is perceived, Davis reminds us here that it is possible to see two sides of a building at once, and that often it really looks like only half of a ship is in the water even though our brains convince us that the other half is hidden behind the fish warehouse. Flatness and simplification of forms were characteristics that distinguished work of influential European painters like Picasso and Matisse, whose work Davis would have encountered during his stay in France.